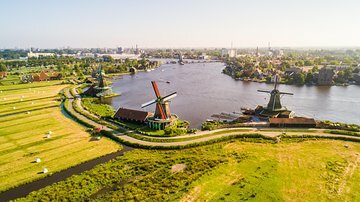 Experimente o velho mundo da Holanda nesta excursão de meio dia de Amsterdã até Zaanse Schans e Volendam. Volte para a Era de Ouro Holandesa em Zaanse Schans, um museu a céu aberto usando edifícios trazidos de toda a Holanda para recriar uma cidade do século XVII. Em seguida, continue até a cidade pesqueira de Volendam, tipificada por sua bonita orla, restaurantes de peixe e casas de weatherboard. Este é um ótimo passeio se você estiver em Amsterdã e quiser conhecer mais a Holanda. Veja dentro de um moinho de vento e visite Volendam, famosa por sua fabricação de queijos, restaurantes de peixe e linda orla. The Windmills are amazing and could easily spend a whole day there. After our demonstration, we only had 30 mins explore the stores and grounds - not enough. Volendam Museum was a old, weird, creepy. Not sure how it is on the schedule still, it really is so creepy and boring. You could go thru it in 5 mins, but they had us there for over 35 mins. Avoid this! Cecilia was funny and entertaining guide. She told us so many interesting facts. Windmill tour was nice, learned about why they use it. Cheese factory and Waffle store was both good. Got to taste some good samples of cheese and waffle and learned how they make it, I recommend it. Seafood at Volendam was very fresh and excellent. It was windy and raining on and off, I wish it was nicer weather. We left that tour and went to Edam which was not really interesting that might be why tour did not take us there. This was the only trip we took out of Amsterdam during our recent brief visit and it was a great choice. How could you be in the Netherlands and not see windmills and the Zeider Zee!! We accomplished a lot in a short period. The tours were brief and we had plenty of time to explore on our own. The tour guide was informative without being intrusive. Plenty of historic and geographic background. It is not often during such a short excursion that you get to meet the other tourists, but our group had a wonderful time together which made the trip even more enjoyable. This tour was not what we expected from the basic description. We were given very limited time at the windmills due to the bus parking lot being full. We had to walk several extra blocks before even getting in. Extra time should have been allowed to see more than just one windmill. This is a beautiful village and we had to rush through it. Our time in Volendam wasnt any better as we should have skipped the cheese shop and cookie tour. This was also a lunch stop but not much time to just enjoy this charming village on our own. The mile walk back to the bus parking lot was tiring. Book a tour of both these wonderful places but only if it lets you off to explore on your own. If you bring kids not recommended to take this tour. I think the pace is too fast for child. There was not enough time spent at the Windmills. My recommendation is to skip the Vollendam Museum and increase the Windmill time.